A Crazy Canuck Living in Zany Italia! : What an insult to the Three Stooges! What an insult to the Three Stooges! In nearly 20 years that I’ve been reading The Economist, I can’t recall once that the fine British magazine has made fun of and/or insulted Canadian leaders as much as they’ve so far done with their Italian counterparts. An article from the May 8th, 2010 edition on Canada’s economy: “The least-bad-rich-world economy. The charms of Canada. Good policies, good behaviour and good fortune: if only others could be as lucky”. VERY rarely do they say the same thing of one of the world’s most corrupt countries, Italy that is! Now take a look at the picture in the May 15th, 2010 edition of the same magazine. 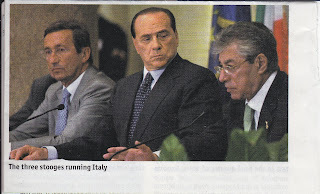 It shows, from left to right, the following Italian politicians: Gianfranco Fini, Prime Minister Silvio Berlusconi and the Northern League leader Umberto Bossi. Nice caption underneath, eh (and what an insult to the famous Three Stooges too)!